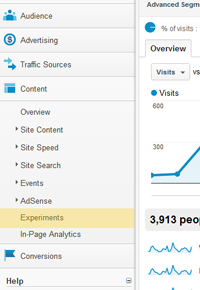 Are you using Google’s Website Optimizer to do A/B testing on your webpages? If not, you’re missing out. Have you ever wondered how adding an additional donation button to your site header might affect your donation conversions? What about short donation form copy versus long? Removing some fields? Google’s tools allow you to easily test these changes and give you hard data to share with your key stakeholders. Google is turning off Optimizer on August 1, 2012. Make sure all of your experiments are completed or migrated to Content Experiments by then. Archive your data! All experiment history will go away when Optimizer shuts down on August 1. Now would be a good time to log in and export all of your data. It’s a little more limited. At this time, there is no solution for multivariate testing. Only five variants can be tested at a time, and only twelve tests can be active at a time in any account. Experiments expire after 3 months. 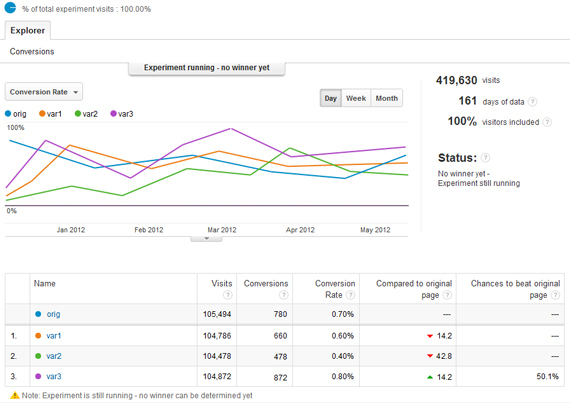 Google will automatically end your experiment after 90 days, whether or not a clear winner has been established. Results require traffic. It takes a lot of traffic to get statistically significant results (don’t worry, Google does the math for statistical significance). Your tests will be most fruitful placed on a page that gets a lot of visitors. This is even more important now that Experiments limits tests to 90 days. Results require conversions. Along the same lines, it is best to track your success based on an activity that a lot of people already do. A test based on making a click-through to a donation page will (hopefully!) yield a lot of data but a test based on people making a $1,000 online gift will probably not yield meaningful results (sadly). Test big! Test things that are likely to make a big difference. Testing shades of red for a donation button is probably not going to get you anywhere unless your site gets a lot of traffic, but testing the addition or subtraction of that button from the site might. As part of our unquenchable thirst for data, M+R has been using Google’s optimization tools for years to help our clients make choices to increase the impact and efficiency of their campaigns, and we’re continuing to do the same with Content Experiments. We think creative, methodical testing can do wonders for your organization’s website, and we would love to talk to you about it! So, what do YOU want to test?